The MFT flange focal distance (AKA register), the distance from the lens mounting flange to the sensor plane, is practically the smallest of any photographic system. In other words, MFT lenses sit very close to the sensor. The upshot of this is that any lens from camera system with larger flange distance can be readily converted for use on an MFT body, using an adapter that does two things: a) provides a suitable coupling for the third-party lens and b) makes up the difference in register so the optics focuses light on the correct plane. Here is a listing of some suitable lens systems. Note that though the C-mount distance is smaller than MFT, there is still enough clearance of the rear lens assembly in most cases. This fact has led to a profusion of available adapters and a new demand for older lenses. Suddenly, orphaned lines that worked only with old film cameras now have a new life on digital. Even in cases where digital bodies do exist, Leica for instance, an MFT camera costs one-tenth as much and allows use of the same amazing optics. 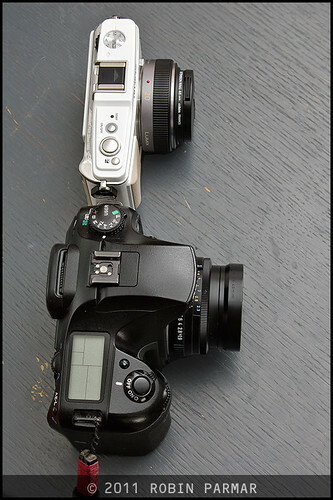 This, not the small size, is perhaps the biggest contribution of MFT to photography. The most logical thing for me to do, since I already own a good number of Pentax lenses, was to get a K-mount to MFT adapter and see how the combination worked. You will be pleased to learn that is exactly what I have done, as the following photo makes clear. 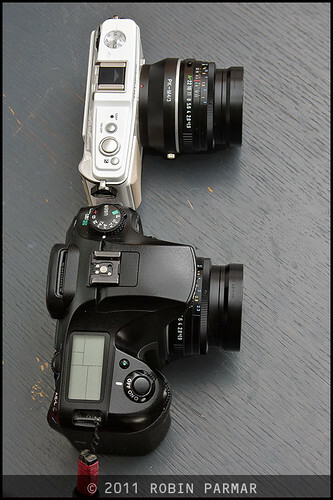 The Pentax K20D is again compared with the Olympus E-P1, but this time both have the FA 43 f/1.9 Limited lens mounted. The rather large adapter is prominent. This is a cheap eBay job that cost twenty bucks. Obviously the size advantage of the MFT system is eroded due to the register requirement. But I look forward to checking out some sample photos, which seems like a good subject for my next article. Oh, in case you were wondering, that's a double exposure. I only own one FA 43 Limited!